The primary function of a direct signal box (DI box) is to minimize noise, distortion and hum, or, ground loops. The DI box simply converts an unbalanced, high impedance instrument output signal into a balanced, low impedance input mic signal (Impedance is AC resistance to the flow of electrical current). A stage DI box is intended to receive and split the instrument (i.e. : electric guitar or keyboard) signal and send the balanced output to the mixer, through the PA, and on to and out the amp. 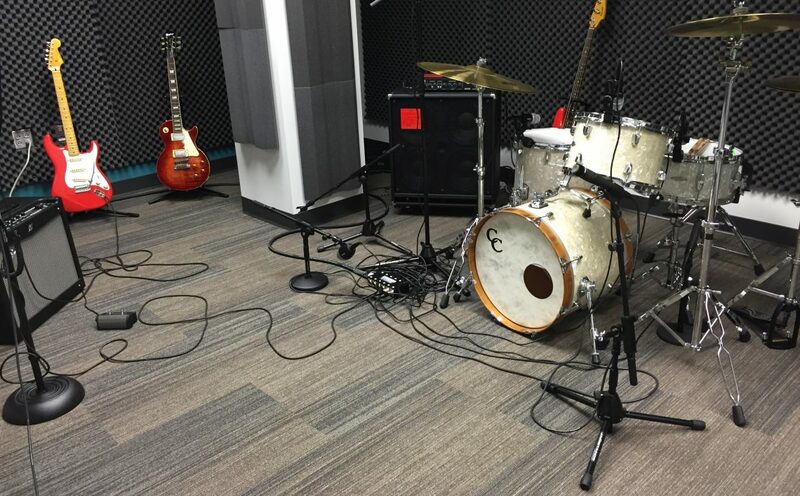 A recording studio DI box similarly connects instruments such as electric guitars or electric basses to a console mic input jack. A studio box splits the instrument signal and sends the balanced output to the audio interface. The “DI” stands for direct insertion or direct injection, which is the process of capturing a signal without the use of a microphone. As a result, the signal is not passed through the air, and does not encounter external interference or signal degradation from background noise. A direct box essentially acts as a transformer. It uses electromagnetic induction to span the gap between input and output. The signal passes through a shared magnetic field. Because there is no hard wiring, the signal is electronically isolated from input to output, eliminating DC noise and (60-cycle) ground loop hum. The primary purpose of a DI box is to convert the (unbalanced) instrument lead signal directly into the (balanced XLR) microphone inputs, such as those of a mixing console. Unlike a headphone adaptor, the size or shape of the connectors do not need modified. Rather, the DI box must convert the impedance differences and voltage between the two sides of the connection. Connector Matching – The DI box typically has a jack connector (to plug in a guitar, keyboard, etc.) on one side of the unit and an XLR output (microphone) jack that runs into a sound/recording console or outlet on the other. Impedance Matching – The instrument has high or low output impedance (the electrical resistance of the circuit that is outputting the instrument’s signal). When the output impedance is directly connected to a mixing console or recorder, a high frequency loss occurs (due to a mis-match of impedances). The DI box provides high input impedance so there is no high frequency loss and correct impedance matching. Signal Balancing – An unbalanced signal consists of a hot conductor and a ground. A balanced signal consists of a positive (hot) conductor, a negative (cold) conductor, and a common ground. Balanced signals can be transmitted longer distances without experiencing outside interference or signal degradation. Unbalanced signals (from a passive guitar of bass) transmit very short (15 feet) distances before encountering signal interferences. The DI box converts an unbalanced, high impedance signal into a balanced, low impedance one. In addition to getting and keeping a clear, uninterrupted signal, a DI box also has a balanced XLR connection, which more effectively runs cables over long distances without compromising signal quality. Most DI boxes (especially passive ones) also prevent ground loop hum and other sound system noise by isolating the input and the output circuit. There are passive DI boxes and active DI boxes. Passive DI boxes are functional without the need of an external power supply. Active DI boxes, on the other hand, provide improved sound and functionality, but must have battery or phantom power, or their own power supply, to operate. Active DI boxes have more options and can add to the signal. Passive DI boxes convert signals and send them on their way. Passive DIs are used on electronics and instruments with active pickups. Active DIs are used to adjust the frequency on instruments with passive pickups. (i.e. : such as cutting off some of the high end on an acoustic guitar). Passive DI boxes are the least expensive solution for musicians. They provide convenience, simplicity, and straight-to-console use. They are referred to as passive boxes because they do not require power to operate. Unlike active circuits when they are pushed to overload, passive boxes act as transformers and do not distort the signal/sound. A smooth transition is made. However, transformers do not handle low-output instruments (i.e. : vintage keyboards, old electric guitars and basses, etc.) well. This is mainly because there is no power to boost a weak signal. In addition to the passive DI box’s hum-eliminating capability, it is equally good at handling high-output instruments, such as those that have a battery-powered preamp. Passive DI boxes do not need the same level of amplification that active DIs do. Passive DI boxes work best with active instruments, such as keyboards, electronic percussion, and active basses, whose on-board preamp output signal is hotter. They have more headroom to handle these hotter signals without overloading. When overloading does occur, the passive DI box helps produce a saturated distortion, which is a more appealing sound. Passive DI boxes are better suited for on-stage use because they do not require power, and because their transformer circuitry his highly-resistant to ground loop hum. Acoustic-electric guitars or basses are also well-suited to passive DI boxes because they are instruments with built-in battery-powered preamps. Electronic keyboards and CD players sufficiently produce adequate output levels. Unanticipated ground loop noise problems encountered during a live performance can quickly be resolved with a passive DI box. However, the passive box should never be sat on top of the amp. This is especially important to note when it is being used to send electric guitar amplifier output to a console. The amp’s power transformer magnetic fields will interfere with the transformer and overpower the DI box’s electronic isolation. As a result, frequency and phase shift and noise will occur. Passive box sound quality issues use to occur because poorly designed transformers were being used in an effort to cut cost. The result was reduced sound quality or ringing and smearing of the upper frequencies. 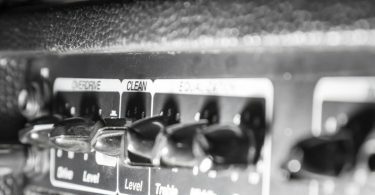 There can be level drops when the DI boxes are used with guitars and basses with passive pickups. When this occurs, it may be rectified by simply increasing the volume on the console. Or, the passive DI box may be replaced with an active DI box. High output for active instruments and broadband instruments, as well as keyboards, acoustic guitars, and bass. Highly recommended for live performances. The primary function of active DI boxes is to provide higher input impedance. It is intended to operate instruments with low-level signals. Active DI boxes were created as a means of improving sound quality while keeping costs down. They accomplished this by providing enough force to drive the instrument without adversely loading the instrument’s pickup. A loss of ground isolation occurs as a result. – Phantom power (48V power; comes off the mixer and is more desirable but does not provide adequate headroom). Active DIs generate a harsher sound (like digital clipping) when they overload. Tube and solid-state active DI boxes are designed, and essential, for direct recording in the studio. Any instrument, including acoustic with piezoelectric pickups, classic basses, or old Wurlitzer keyboards or Fender Rhodes electric pianos, is a candidate for attachment to an active DI box. Active DI boxes add high-frequency intensity for acoustic-electric guitars and electric basses. This enhances slap-style bass playing and aids tonal definition. Aggressive rhythm guitar playing and “slapping” on a bass may still cause distortion. DIs that can accommodate high voltages should be used with high-output acoustic-electric or bass guitars. 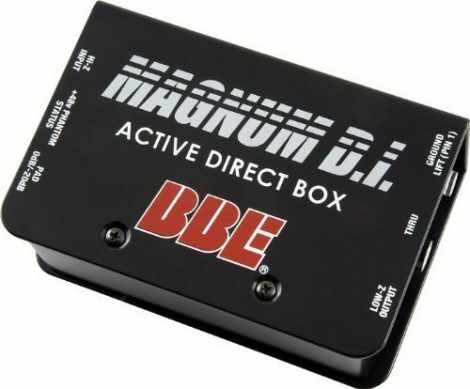 Specifically-made active direct boxes enhance classic bass, electric pianos, guitars, and synthesizers. Others are specifically designed for electric and acoustic guitars (as mentioned above), and straddle the DI box and preamp categories. The band FOH engineer setting up a PA system knows that an active DI box that uses phantom power is a better choice for live performances. AC-powered active DIs are fine in the studio. But there is no guarantee there will be AC power near the stage setup or that plugging the active DI box into a nearby outlet or power source will not cause ground loops and hum. For this reason, the active DI ground lift switch is necessary and must be used to toggle between loud noise and less noise. A solidly constructed steel DI box that more than sufficiently adds more and bolder power to any FOH sound and works well with any type of instrument. Whether you are looking for a passive DI box or an active DI box, you should be certain to select one with high-quality transformers and which has a broad dynamic range. The advantage of having quality transformers and wide bandwidth is better definition and spatial localization, which helps the instrument assume its space in the mix. Input/Output Ports – Ports are basic necessities. Basic (passive) DI boxes have one input port, and one output port that goes directly to the mixer. This may suffice for a single instrument (i.e. : electric or acoustic guitar). More amenities means a higher price. For example, more expensive (active) DI boxes include separate output for amp or monitoring, or multiple input/output options for multiple instruments and complex rigs. Ground Lift – Ground lift is necessary to ensure clean sound and quiet studios. 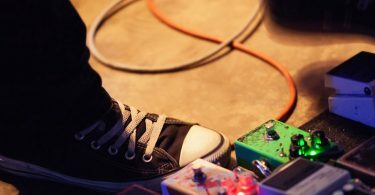 Hum and noise are more likely as you add more music equipment. The more equipment, the more voltage differences there are between them. Passive DI boxes, which essentially are transformers, provide automatic ground lift that automatically reduces noise and hum. Active DI boxes have this as well as a ground lift switch that isolates the unit’s chassis ground from the signal ground. 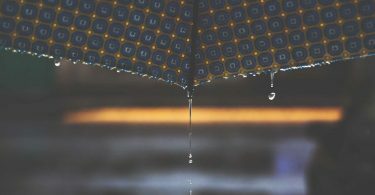 Pads – reduce the signal’s voltage or power level by a fixed amount, for example, very hot signals may be connected without overload and balanced for long cable runs. Thru-put – enables amplifier and console connection. Polarity Reverse – used when sounds that are out-of-phase must be combined. Manufacturers produce a wide range of DI boxes, from inexpensive passive units to more sophisticated and spendy active units. The more features, settings, and user-controllable options the active DI box has, the more expensive it is. Budget – Before selecting the DI box, either passive or active, consider what sound you want and how much your budget will allow you to get. The general 5:1 Rule suggests to invest one dollar on your direct box for every five dollars you spent on the instrument. Durability – The more rugged and durable a DI box is, the more expensive it may be. However, consider the amount of use and hauling the unit will be exposed to. For this reason, the DI box must be more durable than other pieces of equipment. An active DI box provides higher frequencies. Active DI boxes are preamps and typically used on low output instruments. Passive DI boxes are typically used on higher output instruments where hum is a factor. Passive DI boxes provide the most practical straight-to-console solution. They are simplistic, easy to use, convenient, and do not require powering. The plug-and-play Radial JDI MK3 passive DI box is considered to be “the world’s best all-around DI box” by professionals, sound engineers, and multi-instrument users. It provides high output for active instruments and broadband instruments (i.e. : digital keyboards) as well as keyboards, acoustic guitars, and bass. It is highly recommended for live performances. The JDI MK3 is a welded, steel I-beam construction that protects vulnerable electronics from potentially damaging external stresses. Four hex screws lock the internal skeletal frame together. This box’s book-end design protects switches that sit within a protective zone, which is created on each end’s I/O panel. The outer baked-on enamel finish is also scratch-resistant. And the bottom, no-slip rubber pad prevents the JDI DI box from sliding, as well as aids isolation. The JDI MK3 also has a protected faceplate that adds to its long-lasting durability. The JDI MK3 utilizes a Jensen DEB isolation transformer that provides optimum audio performance. It offers superior linearity at all frequencies and level handling. There is virtually no phase, and low harmonic, distortion. It provides complete isolation for reduced noise, and 60-cycle ground loops are eliminated. The input panel features a single ¼ in. instrument input, single XLR, and TS thru-put. 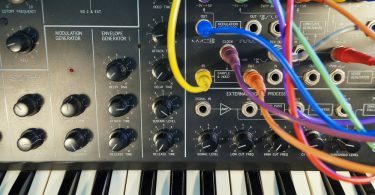 The merge function allows the thru-put to be converted to a second input (allowing stereo to mono summing) making it easier to interface with stereo sources in live shows where there are minimal audio channels. A polarity reverse switch permits interfacing with older non-AES equipment. It may also be used with snake systems without overloading splitters. The XLR pin-1 ground is disconnected by the ground lift switch to achieve full input-to-output isolation. The JDI also includes a higher output -15dB pad to interface with higher output levels. The JDI may be connected (in parallel) with a speaker when a -30dB pad is simultaneously used with the -15dB input pad. This process incorporates a speaker emulation filter circuit, which permits the engineer, for example, to use the post-distortion sound from a guitar amplifier speaker. The JDI direct box is well-suited for use with high output devices, such as active or self-powered acoustic guitars and basses having built-in battery-powered preamps as well as AC-powered equipment (i.e. : drum machines, keyboards, DJ mixers) which have a tendency to overload most active direct boxes giving the instruments a thin or jittery sound. The JDI MK3 may be rack-mounted. Its JDI Duplex model is a stereo, dual-channel version. The 6-channel rack-mountable version is the JD6. 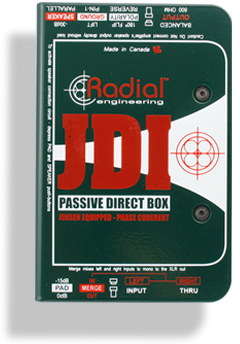 At half the price of the JDI model, the Radial Pro DI passive direct box offers an affordable, high-quality, durable, all-purpose box that utilizes a proprietary isolation transformer to enhance impedance conversion and isolation, ground loop buzz and hum. Low distortion and nearly zero phase distortion makes the Pro DI ideal for live, sound, or studio performance recording, as well as other areas that employ multiple instruments. 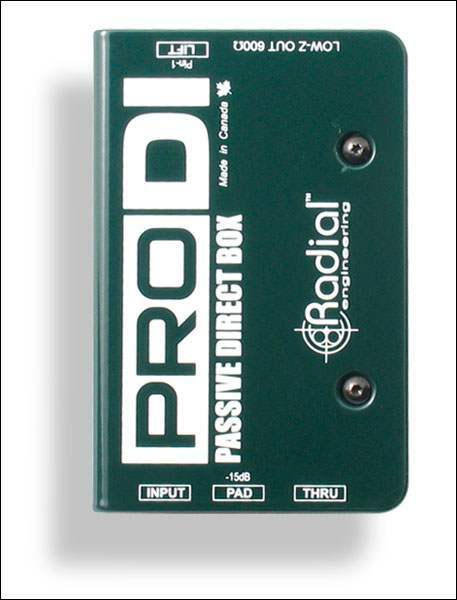 The Pro ID is Radial’s answer to produce a more affordable passive direct box that is suitable for small sound companies, home studios, and community centers and acoustic guitars, keyboard, and bass alike. Other comparable Pro DI features include a standard hi-Z input, ¼ in. thru/input connectors, a -15dB pad, and ground lift output switch. This DI box is made of heavy-duty construction, has a baked, scratch-resistant enamel finish, solid front panel protection, and 600-ohm balanced output that perfectly interfaces with professional snake systems and consoles. The proprietary, custom-built Pro DI isolation transformer meets all specifications for impedance conversion and eliminating noise and minimal phase and low harmonic distortion. It is a sturdy and compact design that is well-suited for live sound and studio performance recordings. Although the Pro DI is not a Jensen, it does include many of the Jensen features and attributes that make the Jensen isolation transformer unique. The ProDI is endorsed by professionals and regular users alike. It will get you sounding good without much hassle. 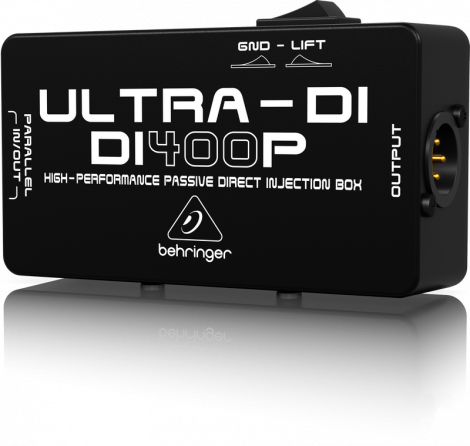 Designed in Behringer, Germany, the Behringer Ultra-DI DI400P is a high-performance, professional, multi-purpose, passive DI box, which is ideal for stage and studio. This compact passive DI box is a quality, very affordable, durable and long lasting unit that comes in its own rugged, road-ready metal travel case. 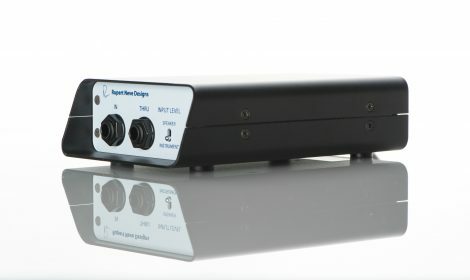 The DI400P expertly provides impedance and signal matching so guitars, basses, and keyboards may be directly connected to mixers and amplifiers. Impedance mismatching presents is not an issue and long cable runs do not compromise tone. Long cables do not cause the loss of high frequencies. The DI400P utilizes its popular BEHRINGER OT-2 transformer to ensure ultra-flat frequency response. The ground lift switch eradicates ground loop hum. The DI400P converts unbalanced line-level signals into balanced mic-level output. Parallel ¼” TRS and gold-plated XLR connectors (Thru/Out jack) allows the user to send the unbalanced signal to an amplifier while the balanced signal goes to the mixer. 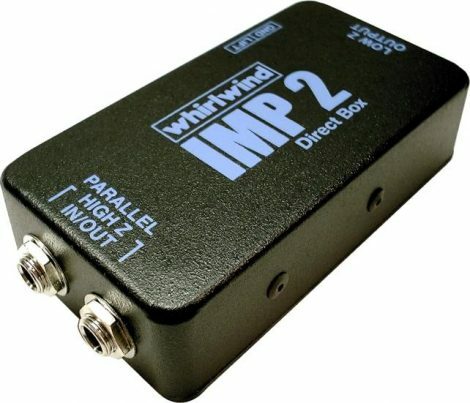 The Whirlwind IMP 2 is a popular and widely-used, affordable, budget DI box. It is simple and no-frills the high-end boxes offer. But it effectively provides the basic economical direct box line conversion and instrument level signal balancing to a low-impedance balanced level. The IMP 2 operates transparently and without parameters that need adjusting. So, it may conveniently and easily be implemented on any type of instrument or amplifier wishing to be plugged into a PA. This IMP 2 has a durable metal enclosure and utilizes a TRHL transformer that provides substantial audio performance. The transformer is also riveted to the chassis for secure transport and sound operation. It also features a standard hi-Z input bridge, ¼ in. thru/input connectors, XLR output, and ground lift output switch. 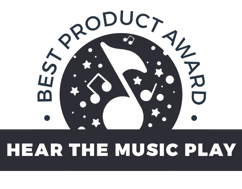 It offers a budget solution for those that are satisfied with their overall sound, and are just looking for impedance balance. The IMP 2 offers a quick and easy option, since regardless what your input source may be, the source can be plugged straight into the console with the correct volume/voltage levels. Active DI boxes are generally better sounding because of their higher headroom and extra features. They offer more features and require AC, phantom, or their own power supply. The Rupert Neve RNDI is highly-recommended active DI box that also works well with any type of instrument. It is a solidly constructed steel DI box that more than sufficiently adds more and bolder power to any FOH sound. Those that initially wanted more transparency returned happily-satisfied reviews regarding the full, energetic, and bigger sound that they got with the RNDI. The RNDI delivers a powerful direct sound, which effectively reproduces the full, harmonic depth of guitars, bass, and acoustic instruments, as well as group and professional line level sources. The RNDI’s signature sound and response is a combination of Class A-biased, discrete FET amplifiers with new Rupert Neve custom-designed low impedance transformers. The transformers add dimensional harmonics while providing superior passive isolation. The RNDI has ¼ in. instrument input and thru-put jack connections, and a gold-plated XLR output connection. RNDI is unsurpassed when it comes to handling long runs with minimal losses. Long cable runs (into amplifiers hundreds of feet away) do not obstruct a satisfyingly balanced output. In fact, they excel. 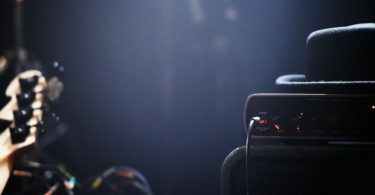 Consistent performance, necessary for live and studio recordings, is equally consistent, regardless of the type of connected equipment. The RNDI amplifier section that features the Class A discrete FET amplifier found on the popular Rupert Neve consoles is what makes this model stand out. 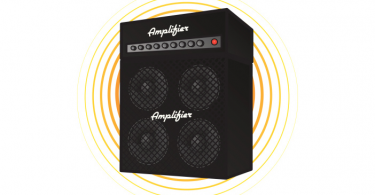 This amplifier runs on industry-standard 48V phantom power circuitry on the XLR connection. The very high impedance input created ensures consistent performance with a variety of instruments. The RNDI Class A design adds no crossover distortion to the signal, or upper level dissonant harmonics to the sound. The AR-133 active DI box offers enhanced audio performance and functionality at affordable cost. It uses the identical enhanced version of audio path as the AR-116, which is a well-respected reference standard. It is useful for studio and live performance. Traditional acoustic and bass guitar sound quality is renowned, and a variety of applications including keyboards, amplifier outputs, DJ consoles, and other electronic sources may be accomplished with the AR-133. It also performs as an active balancing device. This AR-133 unit is contained in a sturdy aluminum extrusion case. It has strong polyurethane end-cheeks which give the unit its distinct appearance. The arched case enables long signals and cables to run neatly underneath the box. The AR-133 runs on phantom or battery power from the console. If the phantom power from the console is accidentally shut off or fails, power is automatically switched over to an internal 9 volt PP3 alkaline battery. AR-133 input is switchable. It includes ¼ in. jack and unbalanced XLR sockets. The parallel link jack output directly feeds amplifiers, while the parallel XLR input socket converts unbalanced signals to a balanced output. 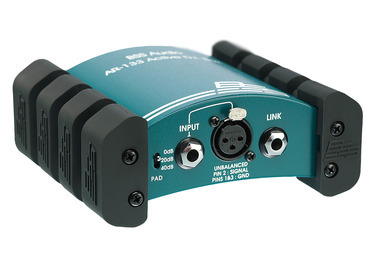 The AR-133 is suitable for amplifier levels or instrument line on inputs. Input attenuation is 0dB for guitar type pickups; -20 for line level signals and -40dB for speaker feeds. The ground-lift switch alleviates hum and ground-loop problems. The BBE D150X active direct box is housed in a sturdy, ergonomic, 14-gauge steel chassis. It is a professional, high quality, versatile, simple, and affordable DI unit designed for road sound and recording studios. It achieves equally excellent results with passive as well as active keyboards, bass guitars, and both acoustic and electric guitars. It excels in direct musical instrument signal transfer to a mixing console. The DI-50X is powered by 48 volt phantom power, or internal 9 volt PP3 alkaline battery should the phantom power fail or get shut off. DI-50X input includes electronically-balanced XLR output. It employs a higher level 2-way 15dB pad switch. All DI-50X ground lift switches, pots, and connectors are directly connected to its military-spec PCB circuit board, instead of being “fly-wired” to the PC board. This advantageously allows the legs of most board-mounted components to be significantly thicker than the narrow conductors commonly used in most audio designs. A DI box is necessary to get the best sound out of, and to preserve, your instruments. It is an essential audio link that should not be overlooked. Before investing in more expensive instruments, PA systems, and recording equipment, research and invest in a DI box to convert critical signals into quality sound.